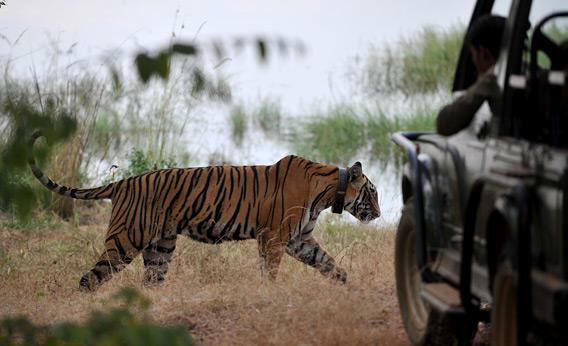 India’s tiger tourism ban: Endangered species rely on tourism dollars. The best protection many endangered species have is tourism dollars. A tiger is seen during a jungle safari at the Ranthambore National Park in Ranthambore, India, around 200kms from Jaipur. Photo by Manan Vatsyayana/AFP/Getty Images. India is home to the largest remaining wild populations of the tiger. Even so, there are estimated to be just 1,500 to 2,000 Bengal tigers left. They are the poster species of the country’s tourism marketing—the face of its national pride. So no wonder a legal bid to ban visitors from the heart of conservation zones, with its potential impact on income, has reignited the debate over the connections between wildlife tourism and conservation. The once far-flung realm of our planet’s largest cat species has been squeezed to a few poorly connected areas—mainly public, protected zones. All are under pressure. Some subspecies are already extinct in the wild, and others risk going the same way. All are the unrelenting target of poachers controlled by gangs that supply the trade in tiger parts for traditional “medicine” in China and Southeast Asia. In India, national and state governments and local and international conservation organizations have devoted considerable effort and funds to protect these animals. As a result, the total Bengal tiger population has recovered slowly during recent decades, even allowing for inaccuracies in counts. Increasing awareness of the animal’s plight is one component of conservation efforts, and tiger tourism is part of this. It started slowly but has grown greatly. Tiger reserves receive tens to hundreds of thousands of visitors a year, which can cause crowds (though this pales in comparison with some wildlife parks in other countries, which get tens of millions of visitors). The animals are adversely affected by direct disturbance, new infrastructure, and human in-migration. Yet crucially, parks agencies and local communities have become dependent on tourism funding, and much of it pays for work that keeps poachers at bay—the key conservation concern for Bengal tigers. In the principal tiger state of Madhya Pradesh, which arguably leads the way in its management of nature reserves, tourism revenue is used to fund programs for local villagers, who act as gatekeepers against poachers. These villagers also have an effect on tigers, but neither they nor the tourists are nearly as severe a threat as poaching. Revenues there also fund anti-poaching patrols, compensate villagers for livestock killed by tigers, and pay for fence construction and other programs. One tour operator has also helped reintroduce tigers. In other states, however, parks do not receive tourism cash and suffer more severe impacts from hunters. Simply put, if tourism money is cut abruptly, poaching will increase. Visitors who come to see tigers bring their own problems, but these can be mitigated. Even in the best of Madhya Pradesh’s reserves, such as Bandhavgarh, Pench, and Kanha, there are day-to-day difficulties. The main problem is inappropriate driving by tour operators as they compete aggressively for tips from tourists. This leads to breaches of minimal-impact wildlife-watching protocols, which aim to restrict vehicle speeds, animal-approach distances, and crowding. Fitting vehicles with GPS units and cameras could help enforcement of the rules. Yet even if tigers are disturbed, at least it is only along roads and by day. Recent research shows they avoid humans by hunting at night. Ultimately, conservationists want tourism to fund expansions of India’s protected areas, by buying, rehabilitating, and restocking land to create private conservation reserves, as in Africa. For this, tour operators first need cash flow; for that, they need access to areas where tigers are relaxed around humans, so that they can be seen by tourists. And that only happens in areas without poachers or villages, in the core sections of national parks that are the focus of legal action. India is a great example of the growing reliance of conservation on tourism, but it is widespread. Over 1,000 mammal species are on the Red List of the International Union for Conservation of Nature as critically endangered, endangered, or vulnerable. A recent analysis I and my colleagues have done shows that conservation of many such species has become reliant on revenue from tourism to a previously unsuspected degree. On one hand, this brings new opportunities for conservation funding, but on the other, dependence on such an uncertain income creates a new vulnerability, were it to suddenly dry up. In Madagascar, Nepal, and Zimbabwe, where tourism collapsed following unrest, many threatened species suffered greatly increased poaching. So sudden changes are best avoided. It is not just poachers that are a problem: Bushmeat hunters, logging and mining, invasive weeds, feral animals, hydro dams, and power lines are all threats. And while parks services in wealthy nations have billion-dollar annual budgets to resist these threats, in some developing countries they have to manage on less than $10,000. For over half of the red-listed mammal species with available data, at least 5 percent of all wild individuals rely on tourism revenue to survive. For one in five species—including rhinos, lions, and elephants—that rises to at least 15 percent of individuals. Yes, that’s risky, because tourism is fickle—but take it away and animals are killed by hunters. It happens every single day, every time patrols stop or hungry locals lose conservation incentives. In India, some conservationists think tigers would be better off without tourists. They brought a case for a ban to the Supreme Court as a doomsday weapon, to force a response. But in Madhya Pradesh at least, the parks agency, tour operators and wildlife groups all believe a ban would cause more harm than good. A negotiated approach that allows tourism to continue is eminently sensible. Update: India just lifted its ban on tiger tourism and is establishing new guidelines for tourism and conservation.